I don't do mornings!!! : 2012.. Jan, Feb, March..... where did you go? 2012.. Jan, Feb, March..... where did you go? I tell you people, this year has already sped past me. What about you? Life is such a fast roller coaster, who knows when the ride will end. Then again, who wants it to? I just realised how tired I was a few minutes ago when I sat down for a break on this, my fourth night shift. The sigh my muscles cried out. Joy! This year has been particularly frought with much anxiety for us Victorian Nurses. As my friends are aware, Our Enterprise Bargaining Agreement was Up late last year and, well, the Government and the Hospitals Association are not playing along and would not negotiate. 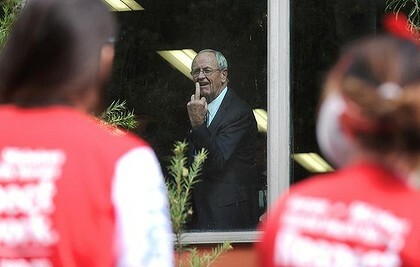 As you can see from the above image, this was a Minister of our Parliament at one time, he is pictured giving "The Bird" to my friends from my work through the window of a library. This is ongoing saga and we have been waiting for them to come to the negotiating table. Nurses did rolling work stoppages (4 hour walk outs from work) leaving the wards with Night Duty staffing ratios. This is how the Government would have it, if they get their way, during a day shift. How can a nurse give quality care to acute patients when she/he has 8-10 people during a day shift? Right, you cannot. This coming Friday we ought to have some resolution. The VHIA and the State Government have agreed to sit at the negotiating table, finally! We will have our Union meeting on Friday and I am hoping they come to us with some plain and simple outcomes to agree on. If not, it will be game on! People will resign. Then who will be giving the bird sign then? Apart from all of this. My family are all very well. Hubby broke his thumb at work, it got slammed in a door on a railway carriage... well, that does not class him as being sick, just a bit broken lol. No laughing matter, it hurt badly.. I laugh still, I know I am bad. That's a pretty sleazy looking minister of the Parliament ... regardless of his wearing a fancy suit. I can't imagine a public official stooping so low...shame on him. Keep up the fight, Cazzie. Why is it so hard for the government to do what is obviously right?